Your Appointment can be booked by calling Vivienne on 0404 505 235 or fill in your details under How to find us. During your appointment you may be prescribed Homoeopathy. Homoeopathy is one of the most popular forms of medicine in use today. Since its inception by Dr Samuel Hahnemann in Germany more than 200 years ago, it has steadily grown in popularity to the point, where it is now taught in many European schools of Medicine. It provides medicines that are easy to use are relatively free of side-effects, and are non-habit forming, economical an above all provide effective relief for most symptoms. One of the major differences between Homoeopathy and Modern Medicine is that homoeopathic medicines seek to stimulate the body's natural defence mechanisms against disease, rather than mounting a direct attack on the disease process itself by pharmacological means. By doing so it works with the body to promote a gentle healing response that is broad in action, dealing with much more than just one symptom or disease process. Homoepathic remedies appear to have the capacity to selectively focus the body's healing potential into areas of pathology, depending on which remedy is used and the strength of the remedy. Your homoeoathic prescription may consists of drops, pillules or tablets. Herbal preparations may be prescribed in tincture, tablet, capsule or herbal teas known as infusions which are not as strong as a tincture. Our first medicines were herbs. Long before we ever thought to take a pill, our ancestors all over the world were finding remedies in the landscape around them. Since these ancient beginnings, scientific research has proven beyond doubt that the active constituents in plants can have medicinal qualities. Herbal remedies are effective because all the active constituents in a herb work in synergy to provide a "whole" effect without the side effects of conventional medicines. A peppermint tea is very refreshing. Peppermint (Mentha piperita) could be used as an antispasmodic, and is know for its ability to calm the stomach and relieve diarrhoea. It also helps to reduce stomach gas. 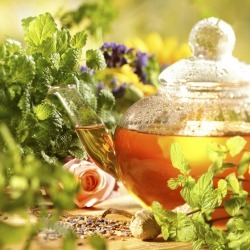 Fennel tea can be a great soother for a colicky baby. Steep one tea bag or or 1 teaspoon of fennel herb in a cup of hot, once boiled water for two minutes, strain if necessary, and then allow to cool. Give your baby 1 or 2 teaspoons of the tea immediately before and after each feed. You can keep a made -up batch of tea for up to 24 hours, then discard and make a fresh brew. Natural healing - by eating organic food and using natural, organic medicine forms a hugely important part of taking control of your life. The benefits include reducing your toxic load providing more nutrients for your body and helping your environment - all of which serve to improve your overall well-being. Detoxification is the cornerstone of all treatments because it encourages the body to shed its toxic load, often with amazing results. In over 50% of cases symptoms disappear just by doing a detox. Put all the ingredients and 3 tablespoons water in a blender and whiz until smooth. Serve as a breakfast or mid morning snack. Detox and eating organics fruit and vegetables means a healthier lifestyle, which in turns means a healthier body and mind. A clean body allows nutrients and oxygen to get to cells through improved circulation and allows herbs and homoeopathic remedies to act much more swiftly and efficiently to promote both health and beauty. Your body is made up of several highly complex, interconnected systems that work around the clock to keep you healthy. Fundamental to good health is ensuring these systems are not overloaded with toxins. The treatments I select for your body's systems aim to maintain the synergy, harmony and balance of your body's systems in order to optimize health. Call me on 0404 505 235 to arrange an appointment to discuss your health problems and formulate a personalised treatment plan.